Emsworth-based Renaissance Choir is embarking on a second year of themed programmes, singing music written by lesser-known composers and works from the Renaissance. 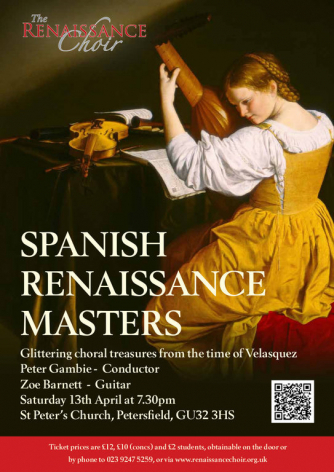 In this concert the choir will be singing works from Renaissance Spain, with the focus of this concert on works by Victoria and Guerrero. The choir will sing a balance of intensively beautiful sacred works and jaunty secular pieces. Music played by award-winning guitarist Zoe Barnett will provide further contrast to the programme. During the concert comparisons will be drawn between the painters and composers of the time.